The South African Football Association (SAFA) in partnership with the British Council will conduct a Premier Skills training that will see 48 coaches and 20 development referees taking part in a grassroots football programme at the Nike Football Centre in Soweto. 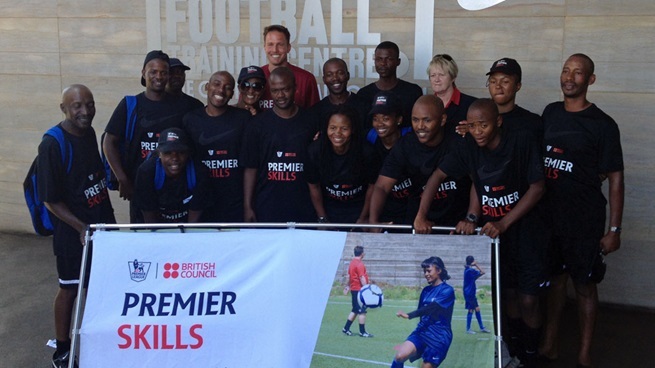 The British Council has held Premier Skills initiative in over 21 countries around the world and it has served as a tool to not only strengthen relations between the two nations but also strengthen the development of football. With grassroots football being one of the key priorities for South African football, SAFA together with the SAFA Soweto region aim to mentor grassroots coaches in Soweto as a means of strengthening the U13 and U15 Leagues as well as other regional tournaments. The British Council, together with the SAFA Coaching Education department will conduct the first phase of the grassroots coaching programme that will kick-off on the 17th of March and conclude with a grassroots festival on the 24th of March where 80 children between the ages of 6-12 are expected to attend. The second phase will see 36 coaches recalled for further training and ultimately, 12 coaches will be selected to be trained as master trainers who will go around the country training coaches at grassroots level. Twenty-four refereeing candidates will participate in the entry level referees workshop between the 20th and the 23rd of March at the Nike Centre. “With the referees’ workshop, we hope to have referees that we can rely on at local level. We further want to have referees that can be identified as ‘fully trained’ and can be called upon to officiate at any mini tournament when needed. We’ll also look at how to fast-track their development, to see them progress to the next level of refereeing. “We’d be happy to see this initiative grow and spread across many regions in our country where we can train many more referees and coaches,” said the Head of the referees department, Lindile Ace Kika. The British Council will provide refereeing and coaching instructors.